The normal kidney size of an adult human is about 10 to 13 cm (4 to 5 inches) long and about 5 to 7.5 cm (2 to 3 inches) wide. A kidney weighs approximately 150 grams. Kidneys weigh about 0.5 percent of total body weight. 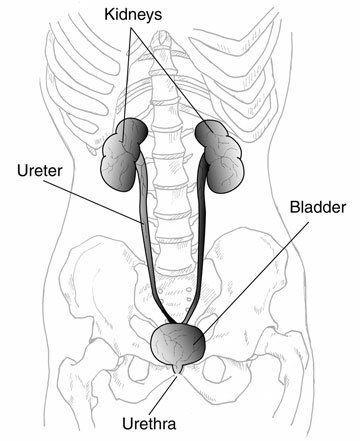 The normal kidney location is towards the back of the abdominal cavity, just above the waist. Normally located just below the liver, on the right side of the abdomen and the other is just below the spleen on the left side. The kidney is full of blood vessels. Blood vessels are integral to efficient kidney function. Every function of the kidney involves blood; therefore, it requires a lot of blood vessels to facilitate these functions. 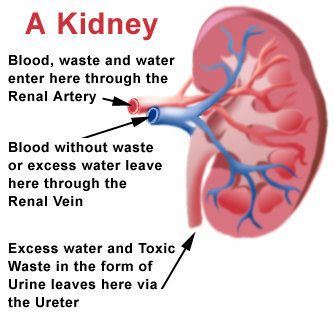 Together, the two kidneys contain about 160 km of blood vessels. and regulation of blood pressure. The kidney accomplishes these homeostatic functions both independently and in concert with other organs, particularly those of the endocrine system. Many of the kidney's functions are accomplished by relatively simple mechanisms of filtration, reabsorption, and secretion, which take place in the nephron. The kidney generates 180 liters of filtrate a day, while reabsorbing a large percentage, allowing for only the generation of approximately 2 liters of urine. Two organ systems, the kidneys and lungs, maintain acid-base homeostasis, which is the maintenance of pH around a relatively stable value.